ToorCamp 2018 Call For Participation! 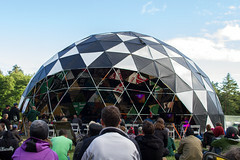 ToorCamp is coming up soon this year and it’s time to think about how you can participate! The CFP is now open and accepting talk and workshop submissions, we’re also accepting art grant proposals, and submissions for any special events or live performances throughout the event. Also, if you’re planning on camping with a group, don’t forget to complete the campsite sign-up form so we can make sure you get all of the resources your group needs! This entry was posted in Uncategorized on February 12, 2018 by davidhulton.